Adventure Game Studio | Games | Oceanspirit Dennis's Holiday Havoc! 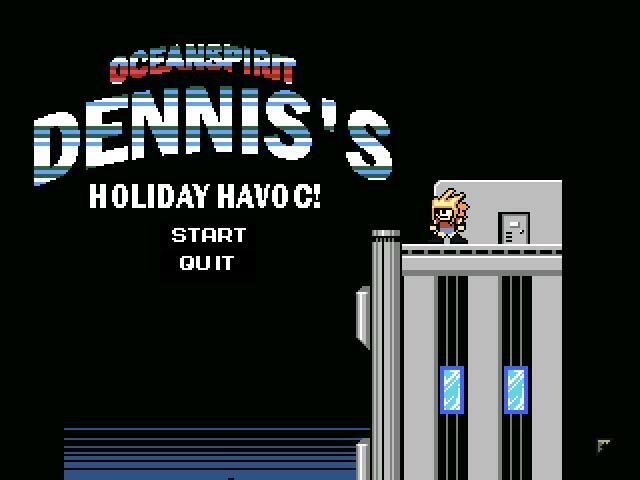 Download Oceanspirit Dennis's Holiday Havoc! In the year 20XX, Oceanspirit Dennis defeated the evil Santa Claus, but now he is back for revenge along with 8 of his holiday pals. Can Oceanspirit Dennis defeat them all? Give this a shot, but damn too much trial and error. This game should give you at least an honest smile; and I don't have much of a sense of humor. It is a parody of fighting games and I think it touches some cultural symbols a little too. The puzzle of the game is simple - according to the laid back disposition that the game invites to. I expected the boss to be more of a challange but you deal with him as with his minions. I think the life bars were too long for the way the battles took place, but I suppose that is an element of satire too. The game is rather short. But considering what is aimed at, it could have many follow ups. The "Occasional, mild" in the description refers to some covered profanities. I did not understand their place in the game but that may be the fault of my knowledge. Have a little fun with this game !